I like ice – in a glass with a drink. 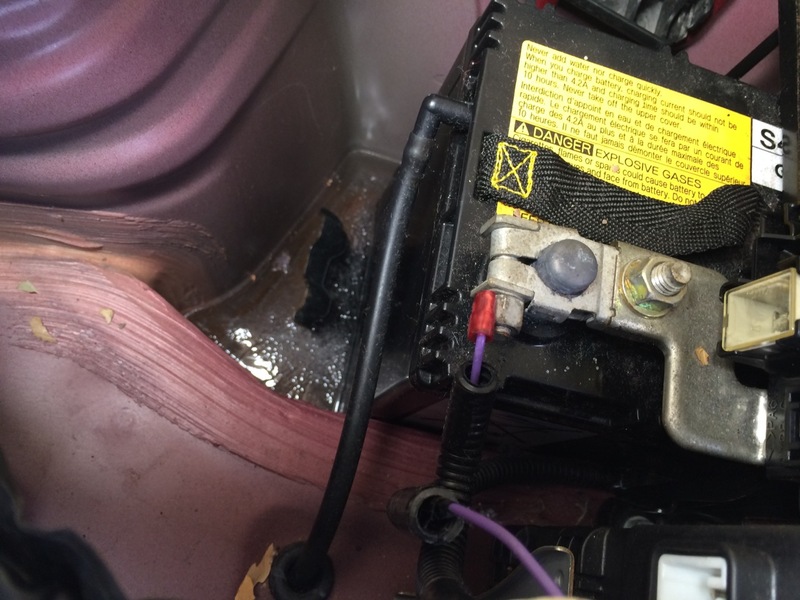 So, when it was time to replace the 12V battery in our Prius, I wan’t pleased to see it frozen in place, encased in a block of solid ice…. Recently, we’ve had a spell of extra cold weather – multiple days of 0 degrees Fahrenheit, with 15 to 20 below windchills. 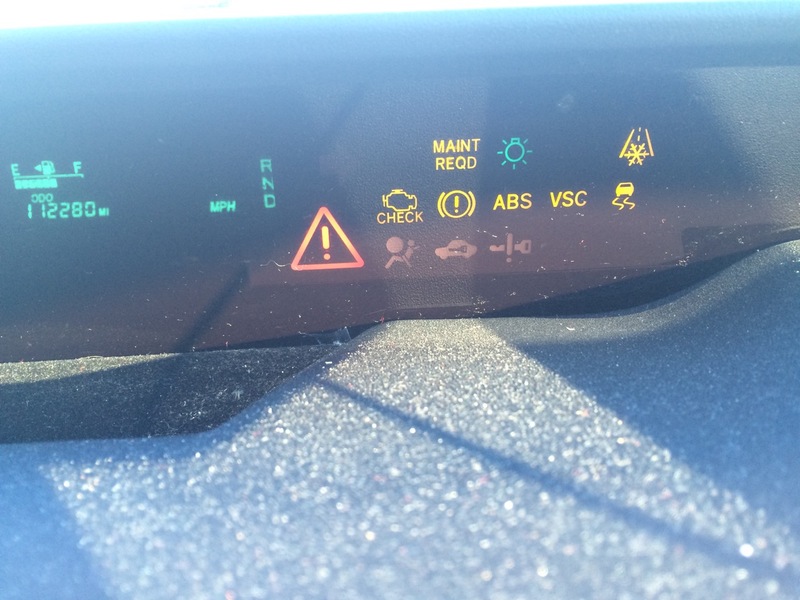 One of those mornings, I got a panicked call from my wife – trapped at the grocery store because the Prius wouldn’t start. I ended up driving over there in the Mitsubishi iMiEV electric car and brought my jumper cables. Sure enough, the Prius was as dead as a door-nail. The dome lights wouldn’t come on, no signs of life whatsoever. Long story short, I got the Prius started, although it took a while and I was not very comfortable. Even after I got it started, I still had to clear out all the error codes and reset the computer. Why the car started OK at the house but NOT later at the grocery store, I’ll never know. The only thing that I could think of is that the car was more exposed to the wind at the store. So, I decided it was time for a new battery. I really wanted to get something better than a stock battery, and I had heard that Optima designed a battery just for the Prius. I had always been very happy with the YellowTops I put in my motorcycle, so I decided I’d get the small Optima for the Prius. I checked online and saw that the local auto parts store had one in stock….. for $230! Sounded a little pricy to me. I checked some other sources and eventually found that I could get the same battery on Amazon.com WITH, here’s the kicker, FREE shipping, for $150. I figured that I wanted the weather to warm up a little before I changed the battery. I cold wait two days for the battery to show up, and the weather to warm. So that’s why I was out in my driveway today. Time to swap out for the new battery. In a Prius, the battery is in the far back right corner. Basically, it’s in the trunk, instead of under the hood. I figured that may have contributed to why it didn’t work. Not only was it cold, but it didn’t even get any heat when the engine was running! I cleared out the trunk, folded back the cover, removed the right-rear panel that covers the battery, and got to work. 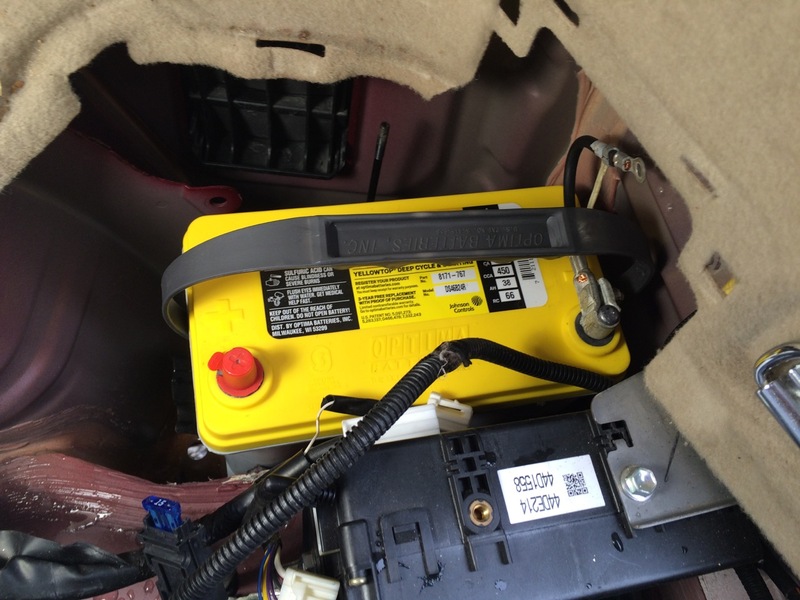 To start with, the top of the battery is covered with several electrical connections that go to a few small fuses right on the battery. I unplugged those. Next was removing a plastic vent that goes over the battery. One bolt screwed that to the bottom of the car. This car is modified with an aftermarket additional lithium battery (A Hymotion L-5 Plug-in System.) Unfortunately, it just made it a little harder to get to this bolt. I had several socket extensions, and I was able to get the 10mm socket down between the Hymotion and the vent. 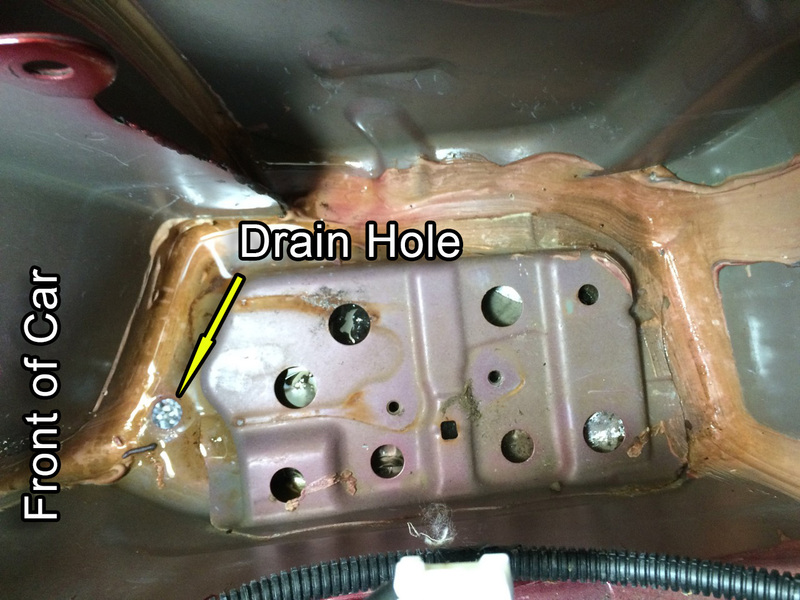 After removing the other bolt that holds the plastic vent tube in place, I removed the vent as well. With the unnecessaries out of the way, I could finally see what the problem with the battery was. It was embedded in a block of ice. OK, well, not completely covered, but it WAS sitting in a layer of ice a good two inches thick. It looked as though someone poured about a half-gallon of water around the battery, and let it freeze. There was NO WAY that I was simply going to lift the battery out. I fetched my trouble light, 1500 watt heat gun, and an extension cord. I started experimenting with melting the ice with the heat gun. Once some started to melt, I had to figure out how to get the water out. I couldn’t really get a towel or something else absorbent easily in there. I did find a piece of vinyl tubing. After a quick check of the water to make sure that it WAS water and not battery acid or some other number or horrible liquids, I sucked on the tubing, slurping the ice-water out and spitting it into a cup. I also have a pry-bar which is a hook on one end and comes to a point on the other. I can never remember the name of this particular tool, but it sure is handy for a lot of things, including use as a large ice pick. I stabbed at the ice, chipping away with the spike, the heat gun blazing in my other hand. Heat, stab, slurp, spit. Not what I usually imagine myself doing in a typical car repair. Once enough of the ice was gone, I was able to completely disconnect the battery, release the tie-down, and pry the battery loose. With the battery removed, I had more room to work. Eventually, I was even able to get at the bolts that hold in the battery bracket. I removed that as well. I thought it was odd that this well in the corner of the car was pretty much the lowest place of the interior of the car, yet it didn’t have a drain plug. Any time I ever looked in the spare tire well on a car, there was always a rubber plug in the bottom that could be pulled to drain the car if water got inside. I looked from the bottom of the car, but couldn’t get a great view without putting it up on a jack. I felt with my hands under the car. I cold feel something rubbery, that was about the right size for a drain plug, but I couldn’t pull it out. After I had everything else removed from the battery compartment, I finally found the drain plug – which was still coated in ice. After further heat-gunning, I was finally able to pull it and drain the rest of the water. How did all this ice get in by the battery!?! I have no real idea, but I do have a theory: There’s no insulation around the battery, it’s just bare car sheet metal. On the right hand side of the back seat, there’s an air vent. 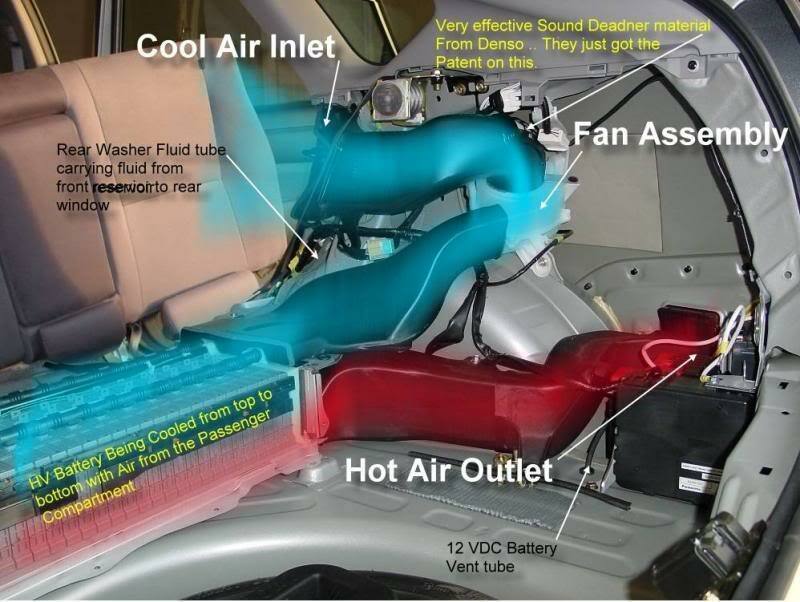 This takes passenger compartment air and blows it through the High Voltage battery pack, to help keep it cool in the summer and warm in the winter. 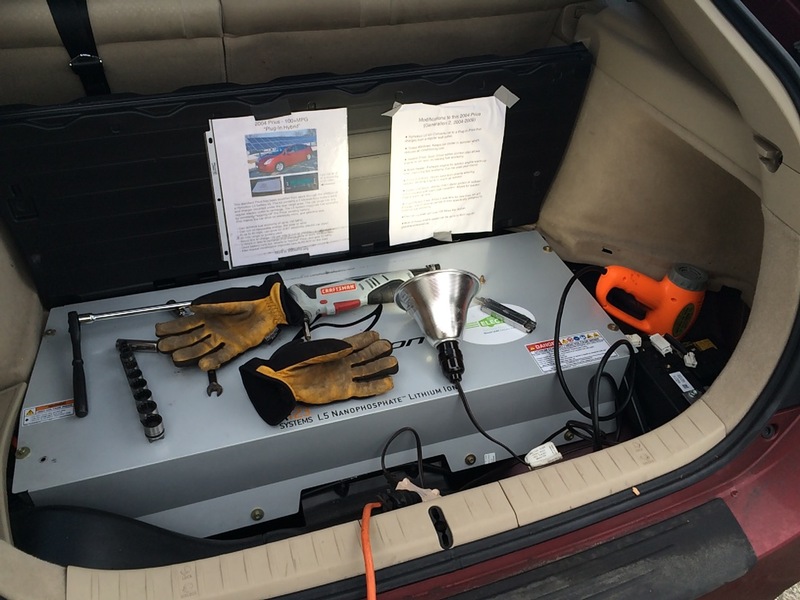 The air then goes through the output vent and exits the car right near the 12V battery. Also, that vent has a large hole in it near the battery. I’m not sure why, but I think it’s so that the 12V battery also gets some temperature conditioning. However, since it’s been so cold, I don’t think there was any reasonable amount of heat going on in the car. So, cold air would go through the battery venting, come out by the very cold corner near the 12V battery and when the air hit the very cold sheet metal, the moisture would condense out and drip to the bottom, around the battery, then freeze. 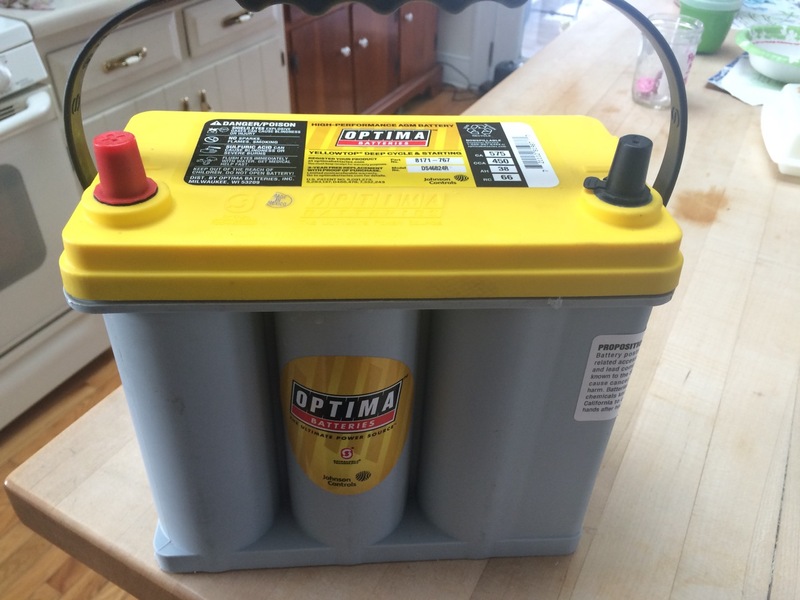 With everything else out of the way, installing the 12V Optima YellowTop battery was pretty straight-forward. I put it in, made all the electrical connections, bolted down the battery tie-down strap, and reinstalled the piece of plastic air-vent. We used the Prius to go visit relatives this afternoon, and everything worked just fine. What’s to keep this ice build-up from happening again? Not much, BUT I did leave OUT the rubber plug in the bottom of the battery well. Hopefully, this should at least allow condensation to drip out. I’ll still need to come up with some sort of solution to keep this from happening again. Although part of the problem was that the battery was old, I’m not sure how well even a YellowTop will do while encased in ice. Perhaps I could insulate the battery – wrap in in radiant barrier? Fill the void with Great Stuff? Add 120V heat tape down around the battery? Who knows! 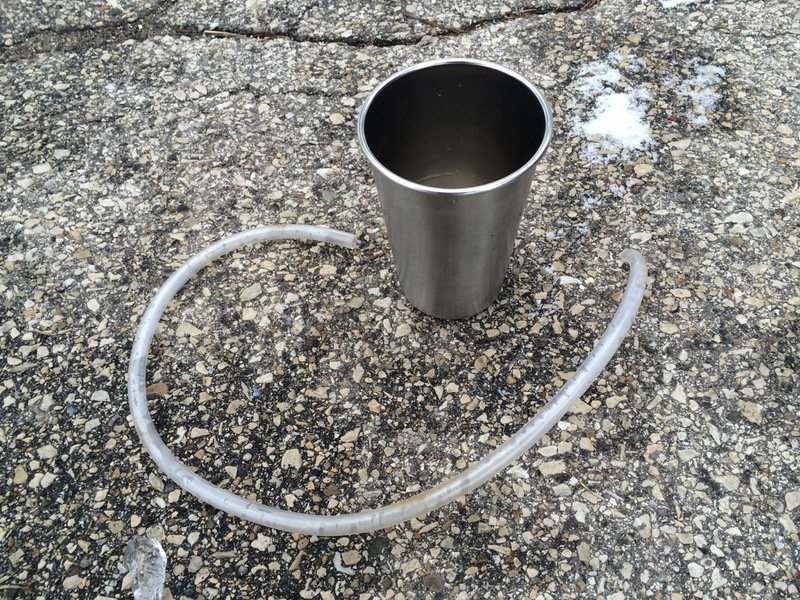 Maybe you have a good idea about how all the ice got down by the battery, and how to keep it from happening again. If you do, let me know! My bil calls it a heel-o bar. Ben, I’ve watched quite a few of your YouTube videos so plz keep up the good work you are doing with EV education to the public! Insulation (maybe undercoat spray) of the compartment to help reduce/eliminate condensation is the best choice, but it still needs better drainage than it has now too. Thanks again for all you do, we are watching! It’s pretty similar to those. Odd tool, but it has been handy for a lot of projects! One of my friends who knows far more about Prius than I said that sometimes a TINY crack can form in the sheet metal seam just above the hatch. Water can work its way in there and end up down by the battery. I checked where he said, and sure enough, there was a crack, but it was SO little, and I REALLY had to be looking for it. I put a tiny dab of sealant there, so hopefully it isn’t a problem any more. I also removed the rubber plug that was in the bottom of the battery well, so hopefully any water that gets in there now has a way back out!